How did you form Manhattan Clique? Philip Larsen: I was making music anyway and went for a meeting at Polydor with a chap called Eddie Ruffett, who said to me during the course of the meeting, "A friend of mine has always been nagging me to go in the studio and do remixes. Can I bring him along to your studio and we'll do a mix?". Philip: So they came to the studio one night and I remember thinking, "Gosh," you know. "We've got two chaps here, what are we going to do? ", because I don't know really whether we knew what we were doing at that point. Chris: We had the Mirwais, didn't we? My club promotions company was working the Mirwais record and I blagged the parts off the Product Manager there and yeah, we needed a facility to do the mix. Philip: So that's his version of events! They needed someone to press the buttons for them. Philip: ...and we went through several different names, Trojan Magnum being the first, named after a brand in the States, which you may or may not be aware of. Philip: ...and... I don't know why Manhattan Clique. Because you liked the EMI Manhattan label? Chris: I think most people think we're from Manhattan as well, which is really funny! Chris: I think Vince had the idea that instead of a support on "The Other Tour" they wanted a DJ instead and that was it. I think as the follow up single was coming, we'd just mixed that and that was at the same time as the tour, as well, wasn't it? Philip: Mmm, what, "Come Up And See Me..."? How did you feel touring with the band? Philip: It was great. It was a real eye opener. I'd never been on tour before, not like that anyway. I'd done radio shows here and there and the odd night away, but to be on the road for two weeks was great. We were with them up until Derby, when the rest of the tour got cancelled. The first gig was the university at Norwich. Basically we didn't have anything planned as such. We had a set list, we had our big neon sign, which has sort of become the whole ethos on which we base ourselves and that was it, really. Chris: We pretty much had a box of records and no idea what we were going to do! Philip: We didn't know how it was going to work and that particular night was alright, but it was quite a steep learning curve, in terms of playing to a thousand, two thousand people, who didn't really want to see you perform and [who] were just waiting for the main act. I think by the time we got to Glasgow - we knew Glasgow was going to be a good gig anyway, which was sort of 10 days in pretty much to the tour, we'd learnt how to work a crowd and we tried to make it more of a show and we really enjoyed that. Glasgow and York, which was the date after that, were fantastic and then unfortunately the rest got cancelled! Chris: I think once we got to the point, as well, that our hands had stopped shaking when we got on stage and we could actually press the buttons to start the CDs and the records it was a bit easier! Philip: I met Vince for the first time on that tour, but only spoke to him twice, basically. Chris: But we went out with Andy, though, didn't we? Philip: And then we went out with Andy and got to know him quite well on tour, but you don't really see each other that much, because you're travelling in different vehicles and we were always sound checking before them or after them and then they were getting prepared. It was quite a strange experience, because although you're on tour with them, we didn't actually see them that much. We'd see them in the hotel briefly and then at the next venue. Was it during the tour that you discussed with Andy about collaborating on his album? Philip: No, because really we only had sort of social evenings with Andy - one social evening, essentially. Chris: The first social evening, they came round for dinner, didn't they? Philip: Yeah, but then we came back and it was nearly a year later that we actually started working together. Chris and I went to Midem and were thinking the remixes were going a bit slow and we were thinking, "We've really got to do something here, you know. What is it we really want to do?" and you know working with Andy was one of the things we really wanted to do, but we had no idea of how to do that, basically, apart from the fact that I knew he lived in Highgate, which is where I live and then it was literally a week later or two weeks later, we saw Paul Hickey walking down to the coffee shop in Highgate and we were too scared to talk to him at first! Chris: He was really nice to us on the Erasure tour. Philip: He was really nice to us, so he just gave us his email address and we eventually, months later, two months later, they came round for dinner and Chris cooked them a slap up spread and we talked about it then and it went on from there. I think they just said give us some backing tracks and we'll see what we think and the first backing track we gave them turned into "Crazy". We just wanted to do one record. Chris: A one-off dance single, basically and then suddenly a week later we were three or four tracks in, weren't we? It was all very, very mental to start with. We gave him five backing tracks and suddenly he'd written words. The way we did it as well - we gave him the backing tracks and he would basically record vocals over the top at his little studio in his house and then MP3 them back to us and we would continue work on it and back and forth and back and forth. He'd come round to do the proper master vocal and everything and we would work on it and then drop it through his letter box on the way home, on my way home at midnight or one in the morning or whatever and that seemed to go on for about a year. Philip: A year and a half, yeah! The new album features duets with Claudia and Jake Shears. Whose idea was it to do them and those artists in particular? Chris: I think I was banging on one day in the studio about how great the Propaganda album was. I've always been a massive, massive fan and I think Andy really likes Propaganda as well. I think we were just feeling pretty bullish, considering we'd just started working with Andy and we just thought, well, you know, "f*** it! Let's email her," and I didn't expect to hear anything at all and suddenly, you know, she's on the phone and it's a bit weird, really. Philip: And she just said, "Send me the track and I'll have a listen and come up with something." Chris: Which she did, eventually. Philip: It took a while! Chris: As opposed to an electro disco track! Philip: Yeah! A straight disco track and it was while we were working on that, he'd been at the Scissor Sisters concert the night before and Jake had done a shout out for Andy, because he knew he was in the audience and had explained that he had always been an Erasure fan and that he used to go and see Andy in New York when they did the shows in the 80s and early 90s and I think Andy just said, "Oh, I could probably get Jake to sing on this," and we said, "Oh, that'd be nice!" trying to stay cool about the whole thing and then sure enough, with a lot of to-ing and fro-ing, it happened, so that was how that collaboration happened, anyway. Did Vince require much persuading to do a mix for the new single? Chris: No, he didn't. I think Andy had asked him a long, long time ago and he'd always said, you know, he'd love to help in anyway. He was always incredibly supportive, I think towards Andy and also towards Philip and myself as well. He's always been very, very supportive in what he's said back to Andy about us and things and I think that's given us a real sort of... real inspiration to push on and to make sure it's as good as an Erasure record, what we've done. You're accompanying Andy on his DJ nights at Electrogogo, Black Cap, G.A.Y. Is he a natural DJ? Be honest! Chris: Be honest? He will be. When I actually started DJing years ago, I just thought it was a case of turning up somewhere with a box of records, but one, you turn up and there's a lot of people there and you mess yourself and two, you don't realise how the equipment works, so I think once we've done a couple of gigs with Andy and we've worked out... Paul actually bought him for Christmas a double DJ deck - CD deck - and once he'd got his head round that and everything, it all became very, very easy. Philip: He's a natural, though. Chris: He knows what to play and he knows the big records and he knows all of that and he's got a great ear. Philip: Because he's got a great ear, he'll match records beatwise, without technically doing it, but he quite often will completely fluke a beat you know and I'll say, "That was in time, Andy!" and he'll say, "Oh, was it?" Chris: But technically, I think we will teach him to mix at some point. I don't think it will take very long to do. I think he's really excited about DJing. It's a big part of our plans together, I think, for the future. 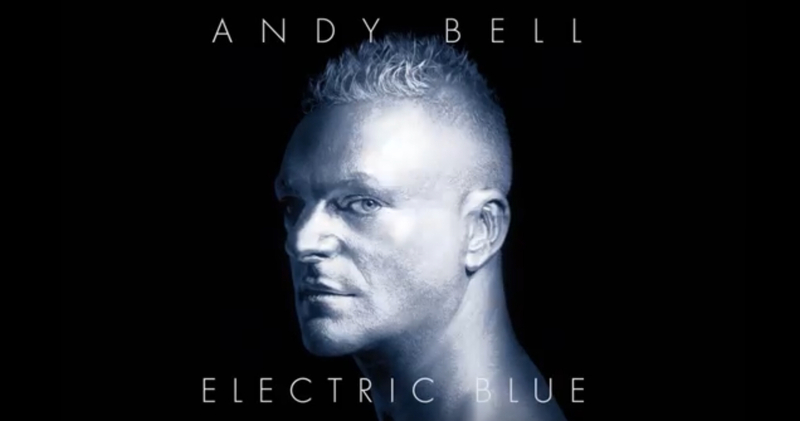 Do you have favourite tracks on the new album, "Electric Blue"? Chris: It changes all the way through, doesn't it, week by week. I like "Jealous", which is a really, really sort of slow track. Chris: Yeah, we won't say which one! Philip: Changed it around, but it was the whole vibe of the string section, which was from a completely inappropriate moment in the film, that's completely irrelevant to everything that the song has become, but it was just a very strange process. Yeah, so that would probably be my favourite at the moment. Chris: You have this sort of love-hate relationship with the songs. There's a couple of that we really, really struggled with and I think we had 24 versions of one song before we got the version that we liked and you end up absolutely hating the songs so much that you never think that you're going to listen to it again, but then you might leave it for two months and you come back to it and it's your favourite song. Are there any other tracks that you want to tell us a bit about the background to? Chris: I think "The Rest of our Lives" is a really, really sort of significant song on the album, isn't it? Philip: Yeah, "The Rest of our Lives" was inspired by a Kirsty MacColl song. Not melodically or lyrically, but in terms of the whole feel of the whole song and structurally. Was it "They Don't Care About Us"? Chris: Which we quite liked, because Andy's a big Grace fan as well. Chris: I think other song-wise, as well, I think "Love Oneself" was really, really special as well. We wanted to do a really sort of out and out Studio 54 Morodor-esque track on the album. Philip: That was Andy. Andy drove that one. Chris: It was just Andy signing it, originally, before we decided to put Claudia on, wasn't it? The other one is "I'll Never Fall In Love Again", actually, because that's inspired by our drug-fueled hedonistic mid-90s club nights, isn't it really? It's really based on the sort of Alex Party sort of sound and yeah, it's a really fun track as well. So what's the future for Manhattan Clique? There's the Goldfrapp remix, isn't there? Anything else? Philip: Yeah, that's with Andy on the vocals. It's an Andy Bell remix with us, technically, isn't it? We've just finished today the fourth Moby remix we've done on the trot, "Slipping Away". What else have we done? Chris: Stereophonics. We're doing Fischerspooner, aren't we? Philip: It's quite busy at the moment. It's funny. It comes in fits and starts. It was quite quiet for about three or four months on the remix front, which suited us fine, because we were busy on the album and it seems as soon as the album's finished, it's coincided with a pick up in work. Chris: In the long term, we're doing a remix album for the B52s and we're planning our own artist album as well, which will undoubtedly feature people like Andy, so hopefully that will come next year, but I guess it all depends on the success of this record, really. Philip: So much will hang on what happens on this record. Chris: I'd be happy if just one person buys it. It's like a really naive thing to say, probably, but even if one person goes out and makes the effort, that's fine. If we sell a million, that's brilliant as well, but, you know, I don't have any sort of expectations, really. Philip: I suppose from a fan's point of view, we just hope that people like it, that they think it's worthy of a solo album and I think they will, on the whole. I'm hoping so, anyway. It is about Andy and what he wants to do and what we wanted to do, so hopefully it'll achieve that goal. Otherwise we'll retire!